Prince Phantom 93P 14x18 vs 18x20... let's discuss. So, I'm interested in the differences in feel, control, power, etc. between these two. I've played the POG for years and thinking about making the move to one or the other... let's discuss your impressions. Not sure many have had a chance to try the 14x18. It’s intriguing for sure. Certainly the 14x18 will have a higher launch angle and maybe some easier power. The 18x20 should have more precision control. Mine is strung up but the weather has not been cooperating. Will report back...hopefully this weekend. Love the 18x20, I’m just hoping for a little more power. Imo, the frame is so well made that even if Prince introduces another in-between string pattern (*16x19), there would be a huge following. Maybe there will be 93P Control (*18x20), 93P Power (*16x19) & 93P Spin (*14x18). TW showed the demo as available this past Monday so I ordered it. Has yet to ship though so I'm dying with anticipation. I love the feel of my 93P's. I play mostly dubs so the low launch angle and nice tight pattern really works well for me. Yes, sometimes I do wish I could make the ball dip like I used to with my PCG 100, or be a better defensive weapon on the scramble, but I couldn't drive the ball as aggressively with the PCG 100, nor did the slices bite as much as they do w/ the 93P. It's such a great point and shoot offensive weapon. Can't wait to test out the 14x18. Huge following from TTW maybe. Unfortunately the average rec players wouldn't even consider it after looking at its head size and static weight, which is a shame. Until they start seeing balls fly past them and start checking out what the other guy is using. The average guy truly believes he needs a tweener to compete. Wilson/Babolat marketing is strong. The average guy truly believes he needs a tweener to compete. I think the problem may be that when a player misses with a tweener they accept it as a bad shot, but when a player misses with a mid, they decide they wouldn't have missed with a tweener, and the racquet must go. Difficult to get the Tweener Devil off the shoulder. The average guy also believes he is so good at tennis that he does not need a tweener. If you cant hit the tweener are you even playing tennis though? Have my demo of the 14x18 and the 100 18x20 ordered as well but has not shipped. According to the rep I spoke to they are in the process of stringing them and qc checked. Weather has not been so great so I don’t mind the wait. Can’t really see myself switching out of the original 93p unless something is drastically different in the other frames that I think it will be a game changer, which I would welcome either way. But should be interesting and fun to try them out regardless. Ordered the 14x18 demo in poly. Grip is L2 though. Will need to build the grip up temporarily, and lead at 3 & 9. Can't wait. Is the 14x18 pattern going to eat strings? Using a mid is not about being “so good at tennis.” That’s another fallacy. People think a tweener is a game improvement stick but it has its drawbacks, depending how you like to play. The Tweener is a power frame that requires serious brushing techniques to control unless you just like to bunt the ball back and consider that to be “defense”. I am not too interested in the open pattern. The SW is lower that I like and the whole reason I switched from the Pure Aero was the open pattern was annoying after a while. A tight pattern lets me string really low and still keep my slices low and heavy. Low tension gives me plenty of trajectory so it’s not something I really miss in my 18x20 racquets. A tweener is not a game improvement stick, but allows players with average tennis knowledge still to play a decent tennis game. Again you are wrong in your comparison. Plenty of people at 4.0 can play with a frame like the p93 without torturing themselves at all. You grossly overrate the impact of the racquet. I walked into a 3.5 mixer this morning in the Desert with all these 3.5’s using tweeners. Everyone hit flat balls. They had no clue how to deal with my topspin FH. They were shocked I could direct my serve. I won all my sets 6-2 or better and at the end they all said, “your no 3.5 with that FH”. Meanwhile I was thinking why all these flat hitting intermediates were rocking Pure Drives and Wilson Ultras and just hitting flat bunty shots around. Here I am with an 18x20 mid and getting way more topspin than any of them. Again I’ll just keep this racket as my secret weapon. Spin is still mostly technique. 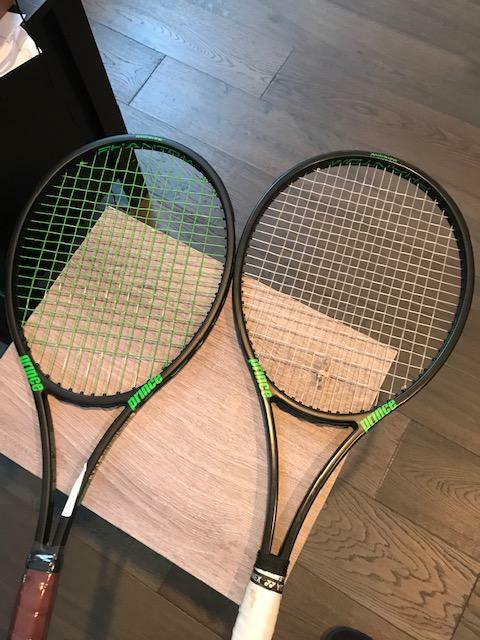 Just received both of these racquets today. Will drop off a the stringer tonight, try it out this weekend. Not sure if I'm going to try a new racquet for my USTA match again. Were these 3.5s older players? Seems like there's cut off between flat hitters and topspin hitters somewhere around age 40-50. All tennis players are consumers to one extent or another, and as such are not immune to the marketing voodoo of companies peddling their goods. So of course most people buy into the racket spec/tech hype, sadly me included to some degree. I have a hitting partner who in his day was a promising junior, he’s well over 50 now. He’s generous enough with his time to hit with me every couple of weeks and run me through some drills, other than that he doesn’t step on a court. I pay court hire and supply all the gear including his racket. I’ve had him hit with an old Wooden Yonex Mingow all the way up to a Prince Phantom Pro 100P and a whole bunch of rackets in between; doesn’t matter what you put in his hand, after a minor adjustment, he’s hitting a consistent ball with all the pace and depth you could want with no shortage of control. For me I’ve seen it first hand, the racket doesn’t make the biggest difference, it’s all in your head as my mate would say. You bet it will. Solinco Hyper G 17 lasts 1/3 less in my PP100P (16x18) than it does in my 93P (18x20), so you can imagine what a 14x18 pattern will do. 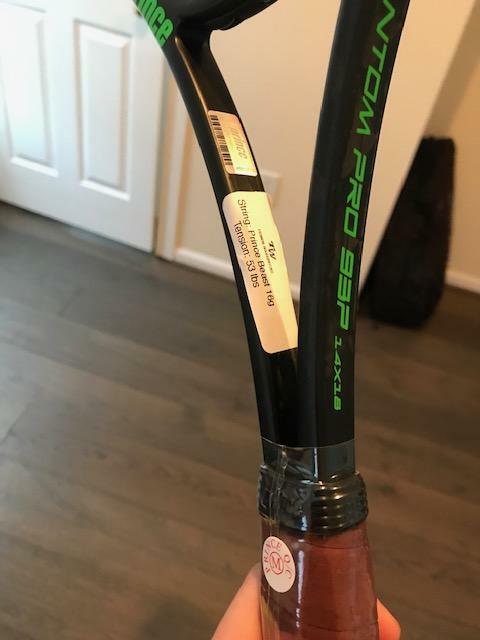 Of all the racquets I have owned over 40+ years, the Prince Graphite Pro 90, which was also 14x18, was the one I broke strings fastest with. The 14x18 pattern probably demands a 16 or 16L gauge in the 93P, while the 18x 20 93P works best with 17 or 18 gauge. They were in their late forties with a couple 70 year olds. I was 3rd oldest in this group of 8. I just wonder if people get success too easily with tweeners that they don’t really delve into technique enough. I used to think people played them because they were addicted to spin, but maybe it’s still the easy power. At least for the 3.0-3.5 crowd. At some point they realized in order to make more money they needed a larger market to sell to, so they had to make the sport more accessible. They slowed the game down (court surface and balls) and made it easier (even bounce and racket technology). Everything is easier, but only up to a point, after which the racket doesn’t help you anymore, and all else being equal the only thing that makes a difference is you the player. I’ve been using a full bed of gut in the 18x20 and not only love the feel, but enjoy not having to restring as often. It also works out to be more economical actually. When I do use poly, I go 18g or 19g Hyper G and love it. Just got some RS Lyon and going to give that a run when I finally snap this NG. As far as the 14x18, I’m wondering if kevlar mains might be the way to go. I’m thinking of gamma syn (favorite cheap syn) or maybe ZX crosses. There’s also string like Gosen AK Pro CX. 14x18 and new 100 demos arrive Tuesday. Can’t wait. I've been using the Exo3 93 for years, which is almost identical in spec to the Phantom 93, but has the string pattern sitting between the two at 16\18. I find this string pattern to be perfect for the 93 head size, so I hope the powers that be do produce a Phantom in that string pattern. I wouldn't be surprised if it turned out to be the most popular. It's great to see Prince back on the map though for the tennis connoisseurs. Agreed. Can't remember the last time when TTW's Racquet forum's first page had this many Prince threads. I briefly tried out the 14x18 during my warm-up session before my USTA match yesterday. Felt like I had much less power than the 18x20 for some reason on groundstrokes. Strung it with Alu Power 125 at 46lbs. It still had plenty of pop on serve though but felt I had less control on serve than the 18x20. Still have to get more playing time with it. I also tried my new Phantom Pro 100 18x20(strung with HyperG 17ga at 46lbs). Groundstroke felt better, hit a deeper ball with more topspin. However, serves were not as powerful as the 93p 18x20, more spin though. Felt dead in the upper hoop at times. I actually switched between the PP100 18x20(return games) and P93 18x20(service games) during the match(which I unfortunately lost). Probably since TW has become an exclusive dealer for Prince in the US, interest for Prince has risen again. I suppose the margin is better than with other brands and it is in the TW's interest to sell them !? And of course, Prince had produced and still produces good sticks. Owners changes and rumors of collapse have done some damage in the past. 14x18 is lighter and lower SW on paper, plus production variance can make the weight difference even more drastic. If you are not sure go for 14x18 as it is probably easier to play with for most. 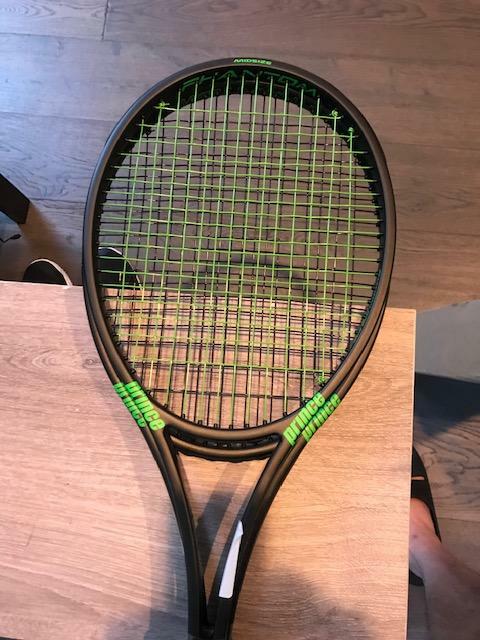 Did you feel like the string pattern added any unique hitting characteristics compared to something like your DR98 lite? Prince marketing is so sad that their new frames aren't even on their own website yet. I wanted to check the manufacturer's specs against the TW measured ones and ... nada. What specs are you looking for exactly? Not really. 14x18 adds more spin and lift, but my leaded up DR98 is still more forgiving due to more generous stringbed and easier to generate spin. You can get it stable at lower weight than 93P. 12.4oz 93P does feel more concise and controlled with more deadly court penetration, also more predictable on slice/volley/touch play. It begs to play first strike tennis a-la Fed. I have a question about the comfort level for the 93P 14x18, and if it feels like the old Prince Graphite 90 14 x 18? I currently play with the Yonex Ezone DR 98, but was very tempted to try the new 93P 14x18. I have alot of mileage on the arm and wrist, so there are lots of frames I can't use due to discomfort. I am hitting the Ezone DR 98 with all poly at 50lbs, and don't have arm issues. I have an old Prince Graphite 90 14x18 that I picked up in a thrift store a couple of years ago. It is strung with hybrid poly / multi. I thought getting it out for a workout last night would give me an idea as to how I might like the new 93P. I made it through about 30 minutes last night with the 90 graphite, and my wrist had reached it's limit. I was feeling all the shock from every stroke coming straight through my wrist. Went back to the Ezone DR 98, and it was so much more comfortable and muted. I know I was hitting an old school frame... don't know what the stiffness was on those 90's back then, but it had no dampening, and my arm would not allow me to play it, unless it was strung with some really soft string, or very loose. So my question is if the new 93P 14x18 is the same old school feel with no dampening, or does it have some modern technology added that would make it more arm friendly to someone with a bad wrist? 90% of the time wrist and elbow pain is a result of mechanical issues not gear. Older frames were 100% graphite or a mix of graphite and fiberglass and absorbed shock much better than a modern frame like a Pure Aero or Pure Drive which are hollow. Get yourself a lesson with a pro to fix your stokes and you’ll eliminate your pain and be able to play with any frame or string you desire. I’ve been coaching for 25 years and have a master’s degree in physiology and physical therapy. Work on your mechanics, grips and footwork and it will make a world of difference. donnayblack99, I am in the other 10%. I have a top 30 national age ranking, was a former college all conference player, former teaching pro, tourney win over a top 100 ATP player in the early 1980's, etc. I'm still a pretty good athlete, but have a lot of mileage on the body, 4 knee surgeries, a back surgery, a couple of broken wrists, etc. The wrist is pretty arthritic. I tape it heavily before every tennis workout, or weight room workout. In most cases I can look at the specs on a frame and know if I can play with it, or if it will be too tough on the wrist. I try to stay with frames around 12 ounces with a flex in the lower 60's or below. I have a game developed in the 1970's with small head, heavy frames, so don't hit the modern huge topspin wristy shots. I've developed a little more topspin, but hit alot of slice backhands, and try to not be too wristy with my strokes. The Ezone DR 98 is so muted that I can use all poly if not strung too tight. I've used lots of different frames over the years, and have closets full of them. But yes, as you mentioned, the 100% heavier graphite frames from the early days are certainly better for your arm than the very stiff modern frames. That said, if you have a chronic issue like I do, it is very clear instantly when too much feedback comes through the frame to your wrist / arm. Before the Ezone DR 98, I played The Pacific 95 for a few years, and it was very arm friendly as well. I've pulled out old frames at times for fun to hit, the old wood frames, what I played in high school and college (Head Ashe Comp, Head Pro, Yamaha Fiberglass), and others. I'm sure I could put a soft string in the old Prince Graphite 90 and it would feel better, but I would have a tough time playing my aggressive attacking game. Was just wondering if the new Prince 93 had the exact same old school graphite feel that the 90 inch model I hit did. If so, would just transmit too much shock into my achy wrist. The Yonex seems to be amazingly muted from that standpoint. The new 93 Prince 14 x 18 sounds interesting otherwise. The 90 inch POG were on the stiffer side back in the day and although not as arm friendly as the Austrian made Head Prestige Mid & MP, it was way better than the current Babolats. True the current Yonex vcore does feels nice, but I never liked the square shape. That said, give the 93P a 14x18 a demo. I imagine it will be very similar to the POG with better dampening properties and less weight. You’re right. You know what works for your own body based on experience. I too, grew up learning on a wood frame and transitioned into steel then graphite. I played div 1 tennis in late 80s with a pro staff 85 and a POGO and never had any injury until I started to dabble in widebody and stiffer frames of the early 2000s. I ended up changing my swing to account for the extra power the frames provided coupled with the poly. I screwed myself up so bad that I couldn’t play or teach for a year. So now it’s 2019 and I’m looking at my bag and I see 4 POGOs strung with syn gut at 45 lbs... I guess we’re both getting old! That 93p open patten is calling my name... we’ll have to see what the spring brings. If Dunlop reissues a maxply in wood I’ll be all over it.! I feel your pain donnayblack99. Wow, if I tried synthetic gut at 45, I might hit forehands OVER the backstop! I was ready to order a demo of the 93p 14x18 until the feel of the old 90 14x18 last night. Still need to give it a try, but nothing like making your current frame feel better than hitting something harsh for a while. I still had a few of my original wood frames from the college days, and a few years ago picked up a range of other popular models from back then. Played the old frames for a month or so a couple of winters ago. Actually liked an old Wilson Chris Evert Autograph wood frame, since it was lighter.... around 13 ounces. The Kramer and Maxply were about an ounce heavier. I beat a couple of my practice partners using wood... they were not happy. Just can't get much pace.... have to try to be steady and run everything down. Well, it's about 30 degrees out in Maryland but my demos just arrived so I may foolishly decide to take them out for a few hits on the machine for a short time. 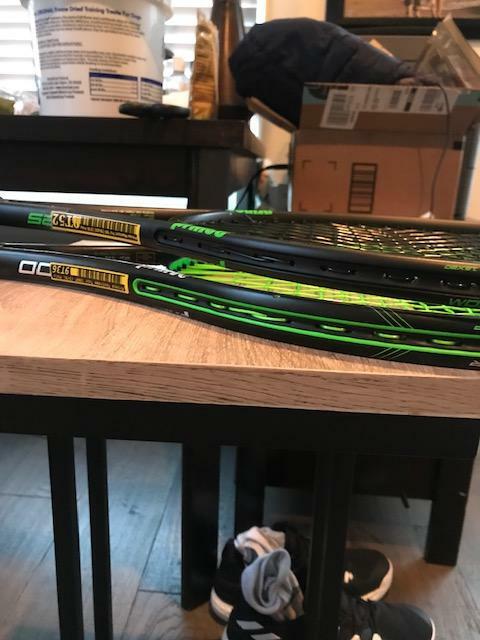 Looks like these are brand new racquets, I always thought demos came off purchase returns or something, but great customer service from TW as always. Almost feel bad about taking the plastic off, haha. The 14x18 came strung with Prince Beast 16 at 53 lbs, which feels like it could be a bit tight, but we'll see. Here is the 14x18 next to my 18x20 93P. Edit: The weather is brutal, gonna have to wait until at least tomorrow to play with them, lol. Not that I place a lot of stock in the numbers, but what is the Prince power rating for each frame? Just curious how Prince thinks they stack up.